The ZigZag feature on SharpCharts is not an indicator per se, but rather a means to filter out smaller price movements. A ZigZag set at 10 would ignore all price movements less than 10%; only price movements greater than 10% would be shown. Filtering out smaller movements gives chartists the ability to see the forest instead of just trees. It is important to remember that the ZigZag feature has no predictive power because it draws lines based on hindsight. Any predictive power will come from applications such as Elliott Wave, price pattern analysis or indicators. Chartists can also use the ZigZag with retracements feature to identify Fibonacci retracements and projections. The ZigZag is based on the chart “type.” Line and dot charts, which are based on the close, will show the ZigZag based on closing prices. High-Low-Close bars (HLC), Open-High-Low-Close (OHLC) bars and candlesticks, which show the period's high-low range, will show the ZigZag based on this high-low range. A ZigZag based on the high-low range is more likely to change course than a ZigZag based on the close because the high-low range will be much larger and produce bigger swings. The parameters box allows chartists to set the sensitivity of the ZigZag feature. A ZigZag with 5 in the parameter box will filter out all movements less than 5%. A ZigZag(10) will filter out movements less than 10%. If a stock traded from a reaction low of 100 to a high of 109 (+9%), there would not be a line because the move was less than 10%. If the stock advanced from a low of 100 to a high of 110 (+10%), there would be a line from 100 to 110. If the stock continued on to 112, this line would extend to 112 (100 to 112). The ZigZag would not reverse until the stock declined 10% or more from its high. From a high of 112, a stock would have to decline 11.2 points (or to a low of 100.8) to warrant another line. The chart below shows a QQQQ line chart with a 7% ZigZag. The early June bounce was ignored because it was less than 7% (black arrow). The two pullbacks in July were ignored because they were much less than 7% (red arrows). Be careful with the last ZigZag line. Astute chartists will notice that the last ZigZag line is up even though QQQQ advanced just 4.13% (43.36 to 45.15). This is just a temporary line because QQQQ has yet to reach the 7% change threshold. A move to 46.40 is needed for a gain of 7%, which would then warrant a permanent ZigZag line. Should QQQQ fail to reach the 7% threshold on this bounce and then decline below 43, this temporary line would disappear and the prior ZigZag line would continue from the early August high. The ZigZag feature can be used to filter out small moves and make Elliott Wave counts more straightforward. The chart below shows the S&P 500 ETF with a 6% ZigZag to filter moves less than 6%. After a little trial and error, 6% was deemed the threshold of importance. An advance or decline greater than 6% was deemed significant enough to warrant a wave for an Elliott count. Keep in mind that this is just an example. The threshold and the wave count are subjective and dependent on individual preferences. Based on the 6% ZigZag, a complete cycle was identified from March 2009 until July 2010. A complete cycle consists of 8 waves, 5 up and 3 down. SharpCharts users can choose between the normal “ZigZag” and “ZigZag (Retrace. ).” As shown in the examples above, the normal ZigZag shows lines that move at least a specific percentage. The ZigZag (Retrace.) connects the reaction highs and lows with labels that measure the prior move. The numbers on the dotted lines reflect the difference between the current ZigZag line and the ZigZag line immediately before it. For example, the chart below shows Altera (ALTR) with the 15% ZigZag (Retrace.) feature. Three ZigZag lines have been labeled (1, 2 and 3). The dotted line connecting the low of Line 1 with the low of Line 2 shows a box with 0.638. This means Line 2 is .638 (63.8%) of Line 1. A number below 1 means the line is shorter than the prior line. The dotted line connecting the high of Line 2 with the high of Line 3 shows a box with 1.646. This means Line 3 is 1.646 (164.6%) of Line 2. A number above 1 means the line is longer than the prior line. As you may have guessed, seeing these lines as a percentage of the prior lines makes it possible to assess Fibonacci projections. The August decline (Line 2) retraced around 61.8% of the June-July advance (Line 1). This is a classic Fibonacci retracement. The advance from early September to early November was 1.646 times the August decline. In this sense, the ZigZag (Retrace.) can be used to project the length of an advance. Again, 1.646 is close to the Fibonacci 1.618, which is the Golden Ratio used in many projection estimates. See our ChartSchool article for more on Fibonacci retracements. The ZigZag and ZigZag (Retrace.) filter price action and do not have any predictive power. The ZigZag lines simply react when prices move a certain percentage. 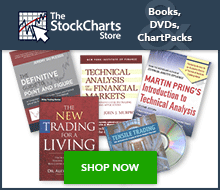 Chartists can apply an array of technical analysis tools to the ZigZag. Chartists can perform basic trend analysis by comparing reaction highs and lows. Chartists can also overlay the ZigZag feature to look for price patterns that might not be as visible on a normal bar or line chart. The ZigZag has a way of highlighting the important movements and ignoring the noise. When using the ZigZag feature, don't forget to measure the last line to determine if it is temporary or permanent. This line is temporary if the current price change is less than the ZigZag parameter, but becomes permanent if the price change is greater than or equal to the ZigZag parameter. The ZigZag and ZigZag (Retrace.) can be found in SharpCharts as a price overlay in the Chart Attributes section or as an addition to an indicator. Upon selecting the ZigZag feature from the dropdown box, the parameters window will appear empty. Five (5%) is the default parameter, but this can change depending on a security's price characteristics. Some securities produce too few ZigZag lines at 5% so the default is set lower (e.g. 3.75%). Some securities produce too many ZigZag lines at 5% so the default is set higher (e.g. 6.25%). The ZigZag parameter can be seen in the upper left corner of the chart. Once the ZigZag feature is applied, chartists can adjust the parameter to suit their charting needs. A lower number will make the feature more sensitive, while a higher number will make it less sensitive. Click here for a live chart with the ZigZag (Retrace.) feature.